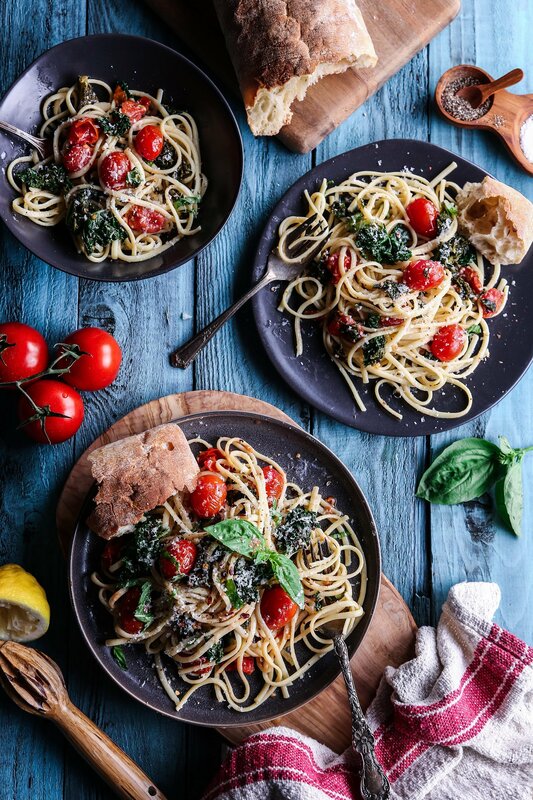 A quick and flavorful lemon-garlic pasta full of juicy sautéed tomatoes and kale. Customize it by adding your choice of protein or cheese! Cook pasta of choice according to package directions until al dente. Make sure to salt the water. Before draining, reserve 1 cup of the pasta water for the sauce. Drain pasta and set aside until needed. Meanwhile, in a large pot or dutch oven, melt 2 tablespoons of butter or oil over medium heat. Add chopped garlic and stir to coat. Add kale leaves and cook for 1 minute. Stir in tomatoes, salt, and a pinch of red pepper, continuing to cook until soft, about 4-5 minutes. Add cooked pasta, olive oil, lemon juice, chopped basil and some of the reserved pasta water. Season with more salt and pepper, to taste, and gently mix together until well incorporated. The noodles really soak up lots of moisture, so add extra pasta water as needed. Remove from heat and top with lots of grated parmesan and/or protein of choice. Serves 3–4.